A nine-metre-tall ceramic structure inspired by the shape of cyanobacteria, one of the world's smallest living beings, has opened to the public at the Eden Project. Designed by London-based Studio Swine, the 20-tonne installation is reportedly the largest ceramic sculpture in the world, and features 32 cannons that fire out vapour rings scented with the "aromas of primordial worlds". Part of a permanent exhibition called Invisible Worlds, which opened today, 25 May, the "breathing" sculpture is meant to reflect the process of photosynthesis first developed by the bacteria approximately three billion years ago. "Around three billion years ago, cyanobacteria first developed oxygenic photosynthesis. In doing so, they changed the nature of our planet," said Japanese architect Azusa Murakami and British artist Alexander Groves of Studio Swine. "In the same way that artists of the past would depict the sacred, our sculpture Infinity Blue gives physicality to the invisible elements our existence depends on; our breathable atmosphere, microbial life and deep time," they explained. The surface of the structure is made of blue clay and oxide glazes that symbolise the oxygen necessary in the process of photosynthesis. The textured pattern on the ceramic tiles is also based on an algorithm of the reaction-diffusion systems – the process of chemical reactions transforming and diffusing – found in living creatures. For the smell of the vapour, Studio Swine worked together with perfume house Givaudan to develop a series of fragrances inspired by the primordial world. "The scent of the vapour tells a layered, 4.5 billion-year history of the atmosphere," said the studio. 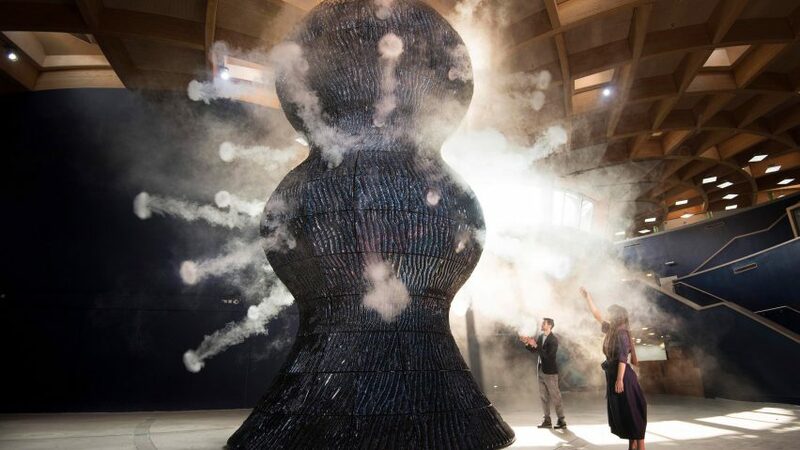 The structure features 32 cannons that fire out vapour rings scented with the "aromas of primordial worlds"
"Studio Swine has created an installation of quite transcendent magnificence which we are confident will captivate all who see it," said Dr Jo Elworthy, The Eden Project's Director of Interpretation. "The artists have shown immense skill in distilling a complex scientific idea into a unique monument to the unseen engines of life that surround us all," she continued. Established in 2010, Murakami and Groves founded Studio Swine after graduating from the Royal College of Art. They named their studio after their first project, a mobile food stall for cooking and selling pig heads, after being asked to publish it by Dezeen. Many of their projects are influenced by the natural world, including a sculptural tree that blossoms with mist-filled bubbles for COS and a pair of shoes made to resemble meteorites.